Project Support Pin | Montreal Irish Memorial Park Foundation, Inc.
We have designed and produced a small number of project support lapel pins. 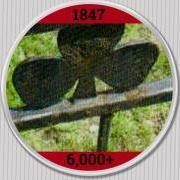 The main image is the rusted shamrock (from the fence around the Black Rock); with the number 1847 at the top (the main year of the tragedy) and 6000+ at the bottom (the number of victims that died and were buried in the area). We are now offering to send you one of these pins with every donation of $ 10.00 or more. Of course with the cost of the pin, and shipping, we are not likely to make much revenue from these pins for the marketing of the green space project. Instead the objective is for these pins to be a "conversation starter". Our hope is that if you are wearing one of these pins, other people, (friends and families etc.) might ask you what it means. This would give you the opportunity to talk about our efforts to build a green space around the Black Rock to honour the victims; the Montrealers that went to help them; and the many citizens that adopted the orphans. The more people that are aware and support the project the better chance it has of becoming a reality! Be sure to include your full name and mailing address with the cheque to receive your lapel pin.